Japanese ballparks are bandboxes, truth or myth? « Japan, Hockey, Baseball, etc. Let’s take a look at actual ballpark dimensions because otherwise they’re just mere speculations and anecdotes. I tacked the MLB averages onto the bottom of the chart for the sake of comparison. Yes, I know MLB stadiums have tons of wonky dimensions, but this makes it interesting nonetheless. 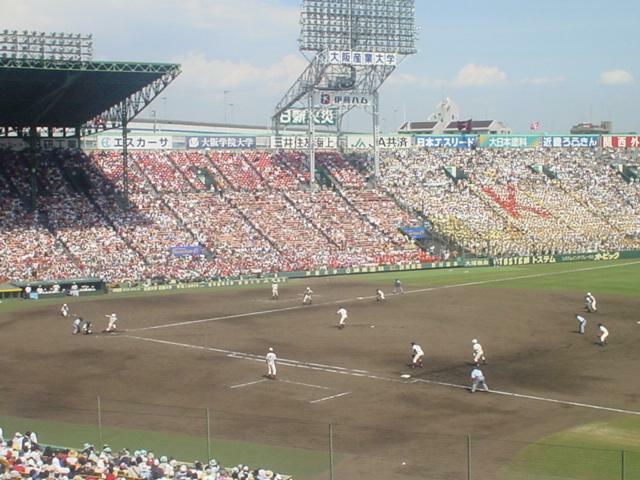 Central League teams play in older and smaller ballparks, while Pacific League teams play in modern stadiums (unfortunately they’re mostly multipurpose domes in the vein of Metrodome and SkyDome), Seibu added a roof and pushed back the outfield walls to its current dimensions a few years back. Swallows’ Jingu stadium is undergoing renovations this offseason where LF/RF walls will be pushed back to 101m (331’) and wall height will be raised to 4.5m (14.9’), turning it into a more conventional stadium from a hitters’ paradise. PL stadiums have almost the same dimensions as an average MLB stadium, but with higher walls. So, this makes PL as a whole more pitcher friendly, as many potential homeruns are turned into doubles. Combining this with the Japanese style of small ball (utilizing bunts, steals, and hit and runs to get that first run on the board to put pressure on the opposition, instead of waiting for the 3 run homer and big innings that is more popular in the majors), the lowest scoring team in the PL won the pennant and the playoffs. That team is the Hokkaido Nippon Ham Fighters (often mistakenly shortened as the Ham Fighters but “Nippon Ham” is the sponsor and “Fighters” is the team name) which was led by the now-KC manager Trey Hillman who embraced the Japanese style of play and often won low scoring 1 run games like 1-0, 2-1, and 3-2 thanks to his superior pitchers led by the 21 year old man-child Darvish Yu whose father is Iranian. I still think that OBP is an underrated skill amongst NPB management, so if some manager in a hitter friendly park can collect moneyball type players of its first incarnation (good plate discipline and power), then his team can have some success at the plate for bargain prices. CL parks, on the other hand, are very friendly to hitters. Especially old Jingu and Hiroshima stadiums with short porches and low walls. Outfield flies that should turn into outs elsewhere in Japan (and in the majors) can become homeruns here. I can’t remember how the Rays’ Akinori Iwamura hit majority of his homeruns (even though I’m a Swallows fan) but this partially explains his significant power drop off when he went to the majors. But this makes the new Dodgers starter Hiroki Kuroda’s record even more impressive, as he had to contend with the fences being so close behind him. Yokohama is also hitter friendly with its cozy confines and minimal foul territory (see below). On the whole, NPB stadiums are boring when compared to their MLB counterparts. Almost all stadiums built or renovated within the last 20 years feature 100m (328’) LF/RF and 122m (400’) CF walls and artificial turf. On top of that all stadiums are perfectly symmetrical. Japan missed the boat on the HOF type quirky modern retro ballparks. But then again NPB has nowhere near the financial clout of MLB to get fancy new baseball only stadiums (with retractable roofs and natural grass) built for them with mostly municipal tax payer money. Apparently the near 20’ wall of Fukuoka Dome is called the “Japanese Green Monster” sometimes, but I’ve never heard this reference before reading it on Wikipedia. Older ballparks that were used before the current ones built or renovated within the last 20 years were smaller bandboxes like Jingu and Hiroshima today, so that is where the reputation comes from, I’d reckon. Homerun king Sadaharu Oh’s 868 career homeruns while playing home games in the smaller Korakuen Stadium (Giants’ and Fighters’ home before Tokyo Dome) are equivalent to 527 MLB homeruns according to this great analysis by Jim Albright. There are nice fairly modern outdoor stadiums with natural grass and large enough capacity in Japan. But unfortunately they’ve either been vacated like the Kobe stadium (BlueWave’s former home before they merged with the Buffaloes and gradually moved all games to the Osaka Dome), or have been built in rural locations and are only used by the NPB in neutral site barnstorming games every year (Botchan Stadium in Matsuyama on the relatively sparsely populated Shikoku island, and Sun Marine Stadium in Miyazaki on the southern island of Kyushu where the Giants hold spring training camps). 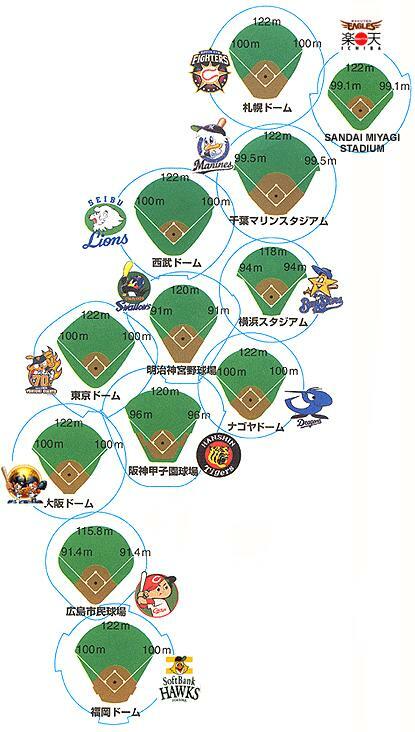 These are drawings of NPB fields to give you an idea of their outfield size, gaps and foul territories. Foul territory sizes range from big in Sapporo Dome to tiny in Yokohama Stadium. Tokyo Dome’s gaps are not rounded like other stadiums, so that makes it easier to hit homeruns to left centre and right centre gaps. Since I haven’t actually done any park factor calculations and whatnot, this is all for now. It would also be interesting to compare this against Korean and Taiwanese stadiums. This entry was posted on 2008 January 10日 Thursday at 15:06	and is filed under baseball, information, MLB, NPB, opinion, statistics. Tagged: ballparks, baseball, dimensions, domes, Japan, MLB, NPB. You can follow any responses to this entry through the RSS 2.0 feed. You can leave a response, or trackback from your own site. Thanks for the nice read, keep up the interesting posts�..